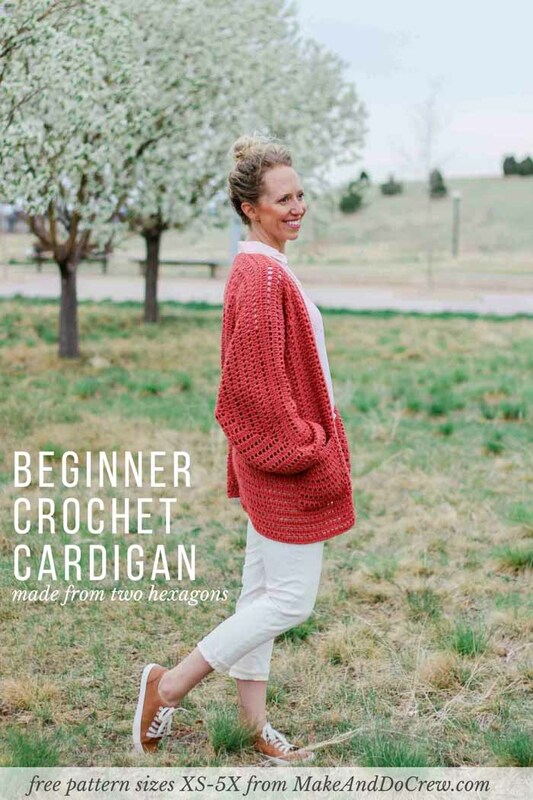 Free, Easy Crochet Sweater Pattern - A Cardigan Made from 2 Hexagons! 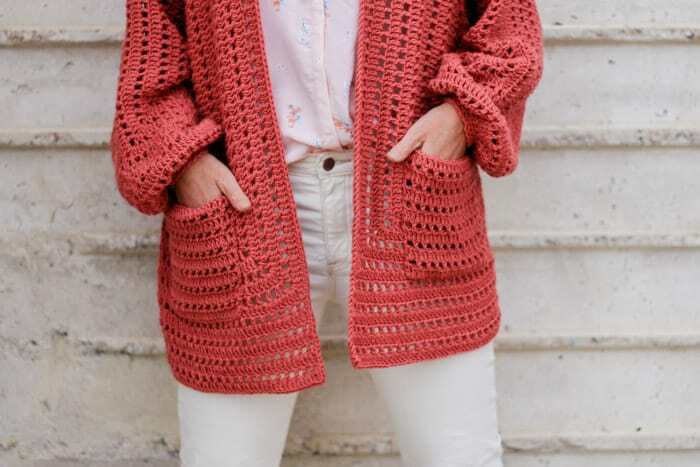 Two simple crochet hexagons transform into a lightweight, on-trend cardigan complete with cozy pockets and roomy bishop sleeves. Get Part 1 of this free easy crochet sweater pattern below or purchase the ad-free PDF of the complete pattern with a stitch chart for $2.99 here. Find Part 2 of the free pattern here and watch the video tutorial here. 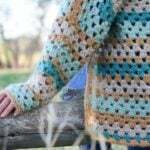 This easy crochet sweater pattern is part of a collaboration with Lion Brand Yarns. This post contains affiliate links. Lately a couple of secret projects have been creating quite a hefty crochet to-do list for me. Yet, despite all these exciting evolutions for Make & Do Crew, I kept finding myself being drawn back to the same WIP (work in progress). If we’ve been crochet friends for a while, you know that I have quite a thing for hexagons. Last year, I designed the Campfire Cardigan, which is a super fun exploration of granny hexagons that magically turn into a hooded cardigan. 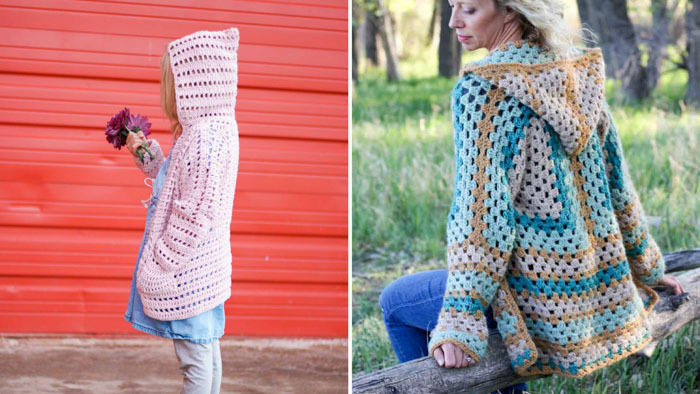 Then a few months ago, I use a similar concept but different stitch to design the hooded XO Cardigan for children (sizes newborn – 14) because my 5-year-old politely pointed out kids patterns are sorely underrepresented in my arsenal. 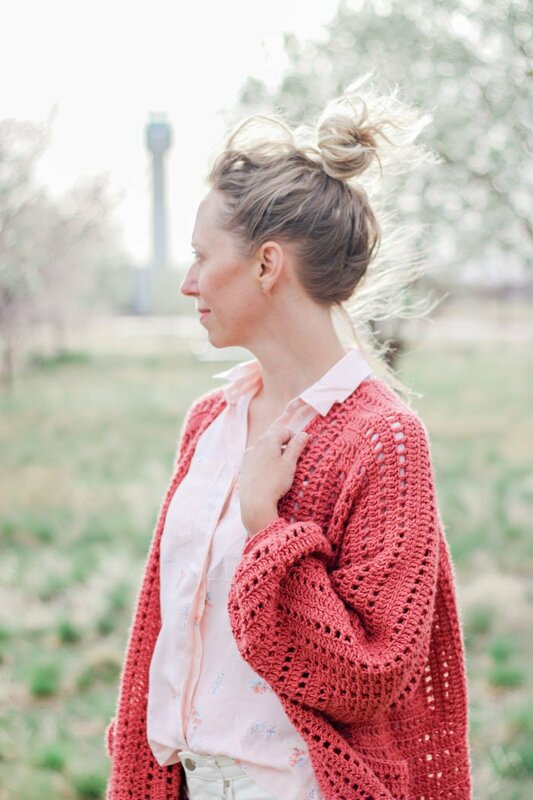 Many of you on Instagram encouraged me to create an adult version of the kids XO Cardigan. 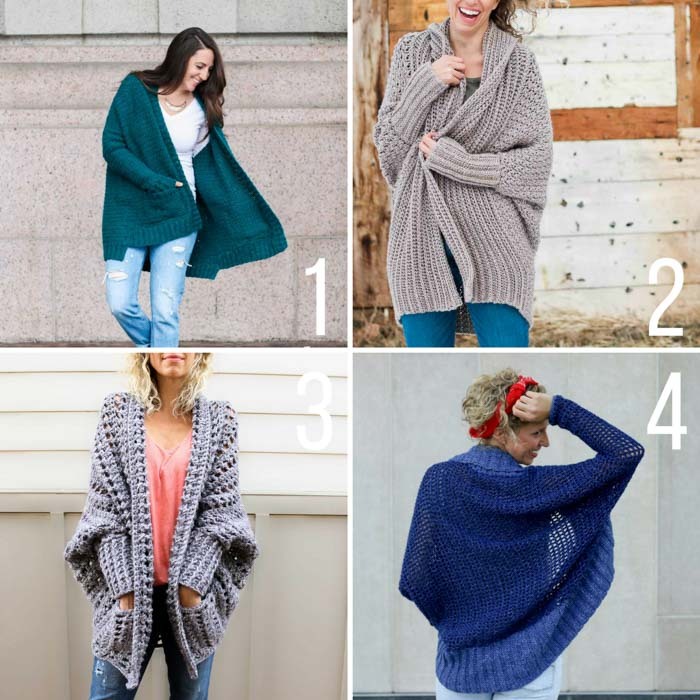 You might actually notice that today’s Day Date Cardigan uses the same stitch as the XO Cardigan to create subtle rows of little open “windows” around the sweater. For this sweater though, I felt inspired to create an equally easy cardigan that felt a little more adult-like and stylish. 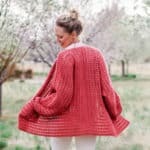 I didn’t know this until my sister informed me a couple of days ago, but these poofy sleeves are called “bishop sleeves” and they add such a deliberate, statement-y (and comfortable!) effect to this easy crochet sweater pattern. 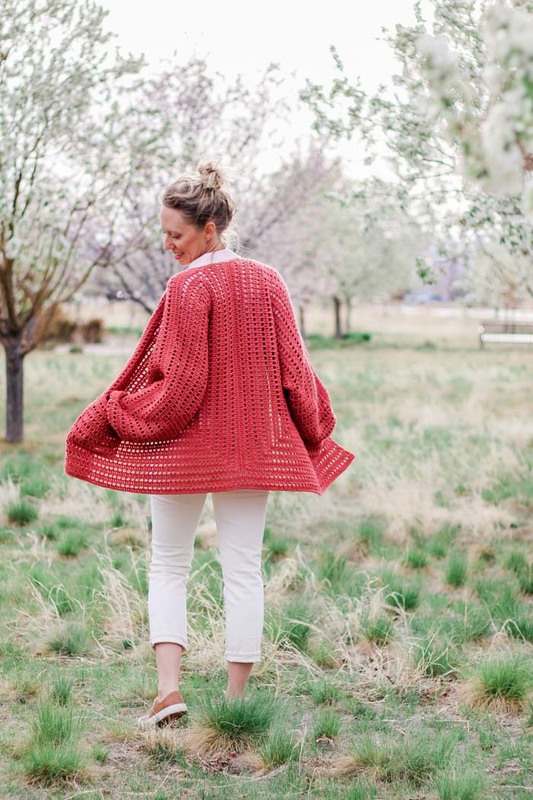 To make a sweater that felt easy and breezy enough to wear in the spring and summer, I knew that some chain space windows would not be enough. The yarn needed to feel lightweight and the color needed to make you want to get outside and celebrate life. Lion Brand Vanna’s Style turned out to be the PERFECT choice! It’s a lightweight category 3 yarn that is easily washable and the stitch definition is beautiful. If you’ve ever used Lion Brand Woolspun, you can expect Vanna’s Style to have a similar multi-ply look, but just without the wool. And this color! It’s even more stunning in person. I’d describe it as a gentle pink-ish red. I’m not always into super bright colors, and this beautiful shade is just desaturated enough to be eye catching, while still retaining a bit of sophistication. I just adore it! And now you can grab a kit with all the yarn you’ll need plus a printed copy of the pattern from LionBrand.com. This affordable yarn is so lovely and not readily available in stores, so snag your kit here or choose from any of the 18 gorgeous colors sold individually here! To keep things convenient, Lion Brand has put together a kit for us. 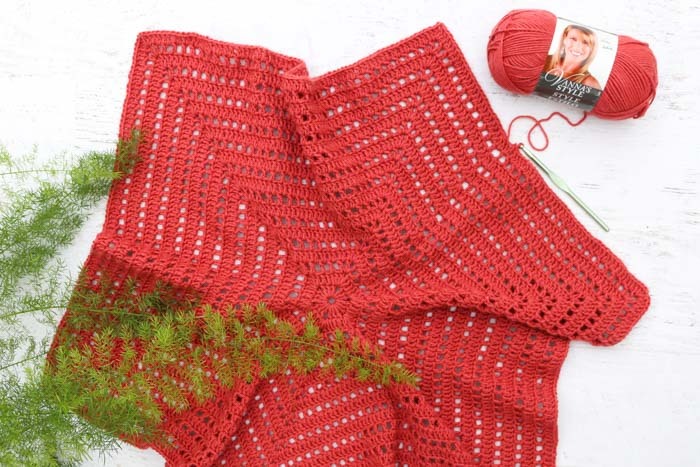 This kit includes all the yarn you’ll need, plus a printed copy of the pattern. You can even order a different color of Vanna’s Style if pink-ish red isn’t your thing. See all the color options here! 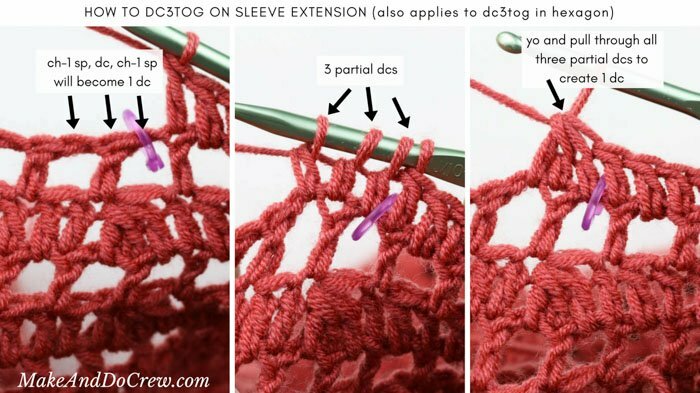 In addition to making this cardigan construction as easy as possible, I wanted to add a few bonuses to the ad-free, printable PDF that will be an extra help to more beginner-level crocheters and anyone who learns visually. 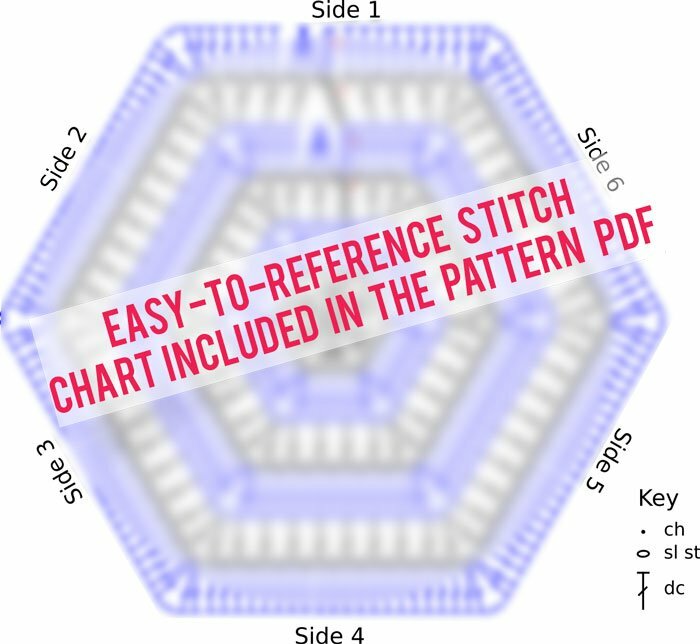 The PDF contains the entire pattern, plus all the tutorial pictures, but I’ve also included a stitch chart for the hexagon as well as a schematic that lists all the measurements you can expect in each pattern size. I find stitch charts to be by far the easiest way to learn and in the case of this hexagon, I think it’s particularly helpful. You can grab the pattern PDF for $2.99 here. I’ve also been thinking that this cardigan could be a great candidate for a video tutorial. If that’s something you’d be interested in, please let me know in the comments below. Thanks! UPDATE: Thanks for your positive response! You can find the full step-by-step video tutorial here! • If you’re a visual learner, you might find the stitch chart at end of printable pattern PDF very helpful. You can purchase the PDF for $2.99 here. Fasten off. Move on to Extensions section. Repeat Rounds 3 & 4, (1, 2, 3, 4) more times. After the last round worked, there are 95 (103, 111, 119) dc for sides 2-6, and 73 (79, 85, 91) dc for side 1. • Back extension is worked along Side 3. Bottom extension is worked along Side 4. See chart above for more details. 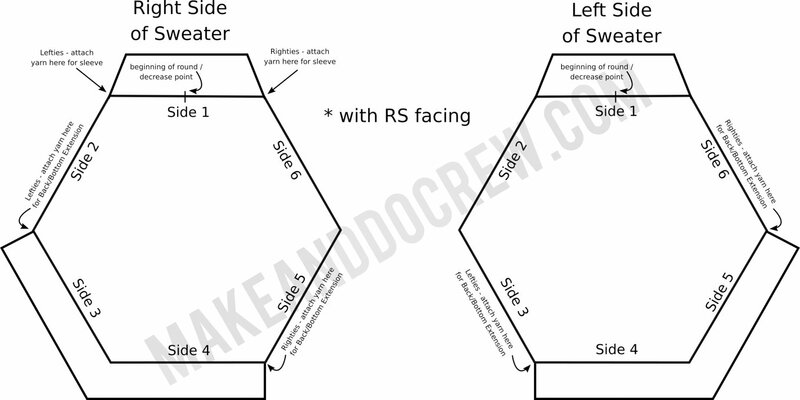 Important: Begin Row 1 with WS facing. • Back extension is worked along Side 5. Bottom extension is worked along Side 4. See chart at end of pattern for more details. Now head to Part 2 of the Day Date Hexagon Cardigan pattern where we’ll work the sleeve extensions, seam the hexagons and add pockets! Or grab the ad-free, printable PDF that contains the complete pattern for $2.99 here! 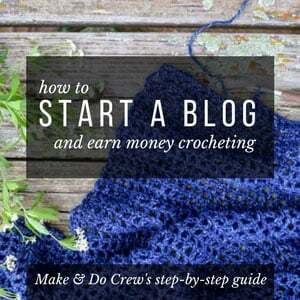 You might also enjoy these easy crochet sweater patterns. They’re all FREE! Thanks Jess! I love it so much. I started the campfire cardigan but never finished it. Seeing this reminded me to go back and finish! I am going to start this one first though. I guess I am just a work in progress lol. I made one of your sweaters – the Habitat Cardigan – and want to upload a picture to you. It’s beautiful, and THANK YOU for an easy-to-follow lovely pattern. How do I get a picture to you, and should I upload to Ravelry also? Yay! I love hearing that! And I’d also love to see a pic! You can share it on Instagram and tag me (@makeanddocrew) if you’re active there, or email me at jess (at) makeanddocrew (dot) com. Uploading it to Ravelry would be wonderful so other people can admire your hard work too! I’m working on the Day Date Easy Hexagon Cardigan using Caron Simply Soft (coffee latte brown) and an H hook, and surprisingly, my gauge matches the pattern’s J hook. Is there a measurement chart that correlates to stitch and row count? This is so cute! I love the oversized sleeves with the cuff at the wrist. I made the little girls version so might have to make me one, too!! Yes for video tutorial!! Love the sweater it is so pretty. Would love a video tutorial of the hexagon sweater. Have made 2 of your Habitat cardigan, one for me and one for a niece. The video made it so easy. Can’t wait to try this one! Thanks for letting me know you’d like a video, Cathy! 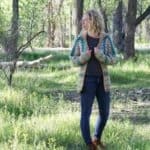 I’m so glad you’ve enjoyed the Habitat Cardigan pattern! Love what I see!! I really would love to do this sweater. I live in Puerto Rico and the weather here is warm to hot, I really do not like to use acrylic yarn. Can I do this in a cotton yarn, if so which do you recommend? Love the look of this sweater! I can’t wait to try this. It seem easy to make by following your steps. Thanks for the pattern. Lovely — but 21 pages of instructions? I like to print mine out but that many pages makes me shudder! LOL. I love this and can’t wait to get started on it. podrias compartir el esquema que no se ve bien?? Help on left side extension my stitches are not adding up. I have 49 chain 1 sp and 97 dc. But I am medium so should I not be 45 ch 1 and 95 in rows 1 and 2? As the small size does not have extension so the first number is for medium. Am I correct here? OK, I have put in to comments and still haven’t received any reply. Can anyone please help me? On the extension for the small it says I should have 95 sts and I keep coming up with 93. Am I supposed to have two stitches in the corners and not one like the pattern implies. I haven’t had any problems up until now. I have watched the video, paid for the pattern and I am still for some reason not getting it. I will go take a closer look now, but I think you have uncovered a mistake in the stitch count. I’m sorry about that! If you’re following the video and everything is looking good in your sweater, I wouldn’t worry about the 2 stitches. I will update the pattern here if necessary (as well as the PDF) as soon as I’ve gotten it sorted out. Hi, Jess. Just started this pattern. Happy with how you’ve done the sleeves. I made two campfire cardigans, one Aran, one DK, for myself and my eldest daughter, and I made the smaller size and then added more rows to the bottom, front, and back. So I kind of did the same, but a different way! I quite fancy making this one in Aran for a thicker autumn cardi. Think it might be nice and warm. Love your patterns, keep up the good work! I am enjoying making the Hexagon cardigan but am also coming up with the wrong stitch count on the extensions. I have redone the extension several times & tried adding stitches but I still come up with the wrong stitch count. Should I just follow what the pattern says to do & not count the stitches. I purchased the pattern & it matches the one on the website so I can’t figure out what I am doing wrong. Thank you so much for correcting the stitch count on the extentsion. As I am so anxious to get this done for my friend. She has been through so much this last year.. She is an older lady and I had already showed her the picture of it and she just loved it. I am doing it in a Seafoam Green by Yarn Zee, Soft Secret. I will post when done. I am going to get started back up so I can try a few of the others, I almost gave up competely. Lol. At 72 yrs old, I am set in my way and just hated to not finish it.